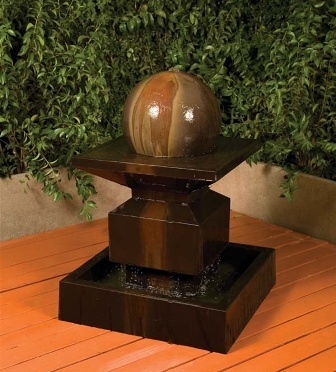 With its bold geometric shapes and strong lines, this fountain will add a touch of elegance and intrigue to your favorite outdoor gathering spot. Water bubbles up from the top of a large 450mm sphere and spills over the square upper tier before finally landing in the basin below. Delightful and unique the Alabaster with Sphere makes a strong statement in your garden or yard. Ships within 4-6 weeks and will arrive securely packed on a pallet. each fountain includes assembly instructions. Shown in Absolute finish.